Many parents want their children to play music. Even if the child does not look like a young genius, then music lessons will anyway benefit him. They will help improve the level of education, broaden the purview, and train the will, because they will have to practice on the instrument regularly and practically without interruption. It has been proven that music classes effect positively on a child’s ability to learn foreign languages, stimulate imaginative thinking, develop mathematical abilities and train memory. And, finally, at all times the ability to play the piano, violin, saxophone, guitar and other instruments was considered prestigious, and people with similar skills were automatically ranked higher among others. Parents who have firmly decided to give their child to a music school and have already bought a piano can keep from conceiving only one thing – the age of the child.. Piano lessons can be started from 6-7 years. At an earlier age any musical school will hardly agree to take your child. Experts say, during younger age it is impossible to give a real assessment of the musical capabilities of children. In addition, studying at a music school requires perseverance; The ability to write and read is also a prerequisite. If you have an acoustic piano at home, then do not forget about such an important procedure as tuning. When a child takes the first steps in music, it is very important that each component of the learning process meets the requirements, so that the piano must be tuned as needed. If you buy a digital piano or electronic keyboard, then you can forget about such problem – these instruments don’t need tuning. Nowadays young people are not always inspired by violins and pianos, but such popular instruments as guitar, saxophone or percussion cause excitement and awe. Specialists do not recommend putting a hand on these musical instruments at an early age, so if your child’s love for music manifested itself in 8-9 years, then it’s time to start learning to play these instruments. Every child attending a music school has periods when he wants to quit school and never see a hateful tool in his life again. The parents’ task is not to put pressure on the child, not to force them to go to classes from behind the stick, but tactfully support and unobtrusively explain why it is not worth it to take such important decisions and why you need to do music at all. I can say that I had such a period when I was about 13. I wanted to give up my music lessons, though I had only one year left to study. Thanks to my parents – they persuaded me to study one more year and to graduate with red diploma, and I never regretted it. So, the best age for a child to start taking piano lessons is 6 or 7 years old. Some musical schools have preschool department, where you can take your child starting from 5 years, or you can take a private teacher for him. But not all piano teachers agree to work with very small children. 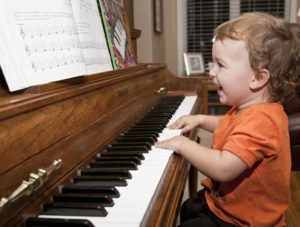 If you are not a child and you want to start learning piano at the age of 20-30 years or older, don’t give up the idea! You will certainly achieve this if you want! I’ve read about the benefits that can come from learning a musical instrument, so I’ve been thinking it would be a good idea to put my daughter in piano lessons. I appreciated your tip that you provided how I should wait until she is 6-7 years old before enrolling her. She turns 6 in just a couple of months, so would you suggest I start the search for a good teacher now? Learning with musical instruments can help children improve their hearing skills and skills necessary for education and social interaction. There are many benefits or positive effects of music, especially piano for a child. Playing the piano can stimulate the intelligence or intelligence of children who learn music. Therefore, why parents want their children to play music because it is very useful for them.